As part of its commitment to the health and vitality of Yarra Park’s trees, MCC will undertake a program of planting new trees and removing health and structure-compromised trees. The program will ensure the ongoing rejuvenation of the park by diversifying the species and age profile of Yarra Park’s trees for generations of park users to come. The planting program will take place during July and August and will see more than 90 new trees planted, while 68 trees of ‘fair’ to ‘poor’ health and structure will be removed in early-July. The removed trees will be mulched and placed around existing specimens to ensure their ongoing health. In many instances, removed trees will be replaced on a like-for-like basis, while historic Elm avenues will be restored and overcrowding in selected locations addressed to provide optimum conditions for existing trees to grow and prosper. Supported by Yarra Park’s irrigation system, the trees will be giving significant opportunity to establish and thrive in coming years. The 2017 program will continue to add to the net gain of trees in Yarra Park since the MCC commenced management of the park seven years ago. We look forward to continuing to replenish and enhance Yarra Park’s tree species for years to come. UPDATE: In response to the 2017 Yarra Park annual tree audit, a total of 37 trees will be removed from Tuesday 10th July due to poor health and structure. This will be offset by the planting of 46 new trees, highlighted by the installation of 26 semi-mature Elms generously donated by the City of Melbourne. The new plantings in Yarra Park will take place from Tuesday 17th July to infill vacant sites and replace trees that have been removed for arboricultural reasons. The species selected for the sites reflect the existing species, the Yarra Park Master Plan (2010) and the reinforcement of elms (Ulmus spp., particularly English Elm) along the main avenues. The tree planting will help maintain a high level of canopy coverage throughout Yarra Park and has been assisted greatly by the installation of a water recycling facility in the park three years ago, supplying water to the parkland and the MCG. Patrons riding a bicycle to the MCG are asked to refrain from locking their bike up on the MCG concourse, or in an area that is likely to cause an obstruction or is too close to congested queues or crowds of people. At present, there are approximately 80 bike hoops in Yarra Park, with most of those close to the concourse. We ask cyclists to use these hoops when riding to the MCG. 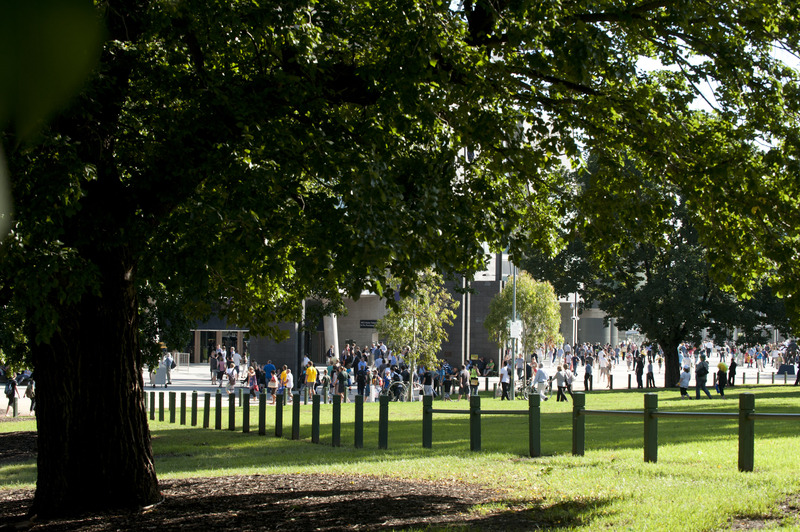 For security, safety and emergency management reasons, all vehicles – including motorcycles - are no longer permitted to park within 30 metres of the MCG concourse. Motorbikes that have previously been parked close to the MCG, particularly at the corner of Jolimont Street and Jolimont Terrace, will be prevented from doing so during the 2017 AFL season, as they were in the latter half of 2016. Riders of motorbikes will instead be encouraged to park on the gravel area adjacent to William Barak Bridge, near the intersection of Jolimont Street and Brunton Avenue. Alternatively, motorbikes can enter Yarra Park as per other motor vehicles at a cost of $10 (cash only) and park on the grassed areas (subject to availability) as directed. We appreciate the understanding and co-operation of motorbike riders as we seek to enhance the safety and enjoyment of all those who visit the MCG.